G.I. Joe fans – here it is at last! This is a faithful reproduction of the original Cobra Missile Command Headquarters set from 1983! This is the playset that gave kids a place for Cobra forces to gather and launch their evil plots. Assemble the highly detailed, sturdy graphic board components to build a Cobra HQ that includes a missile base, missile support systems, cruise missile, control panel, elevator, work platform, and seats. Move the elevator up and down to take the figures to different levels. Raise and lower the missile to place it in firing position. 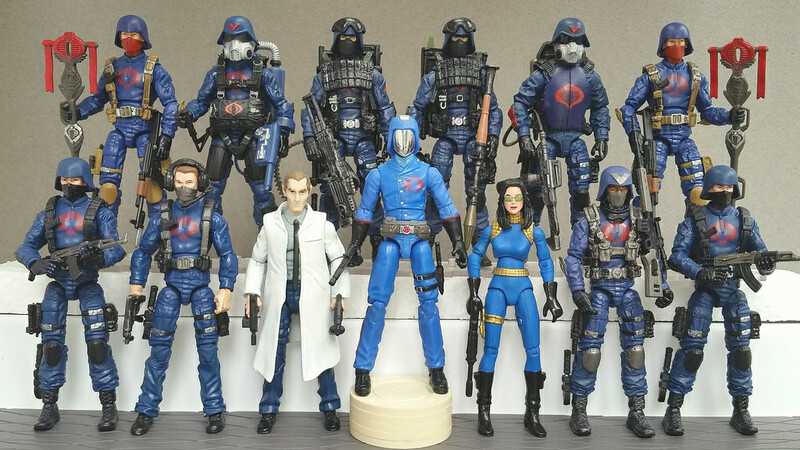 The set includes reproductions of the 3 figures that came with the original set – Cobra Commander, Cobra Officer, and Cobra Trooper. File cards for the figure are included, and a file card holder for the cards. The box also replicates the original package’s design, completing the recreation of this iconic Cobra playset. • Includes: 3 Cobra figures, Cobra missile base, missile support systems, cruise missile, control panel, seats, elevator, work platform, 3 fasteners, 3 file cards, accessories, and instructions. What are your thoughts on this custom Cobra Original 13 set? Sound off after the break! 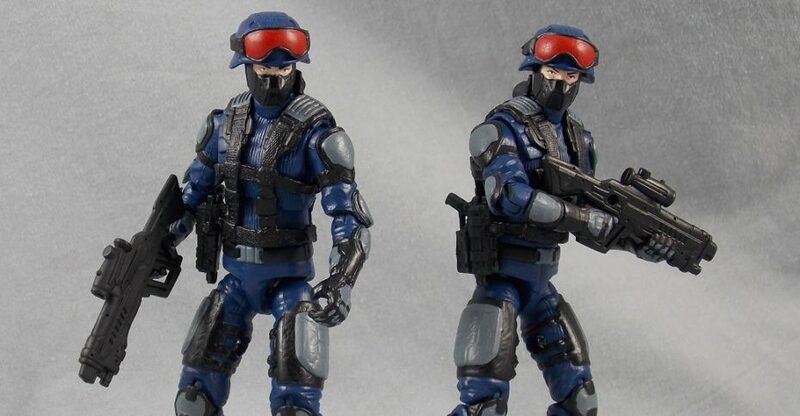 By way of the io9 comes official details of the G.I.Joe exclusive being offered this year. Hasbro’s recreation of the set, which will be available at its San Diego Comic-Con booth (#3329) and later on HasbroToyShop.com for $50, still uses cardboard, but with recreated graphics. Hasbro’s even gone to the trouble of making the box look weathered so it appears as if it’s been sitting in your parent’s basement for decades. After all these years, you can finally add this piece of cardboard beauty to your collection! For those of us that won’t be attending SDCC, time to get those F5 keys ready! 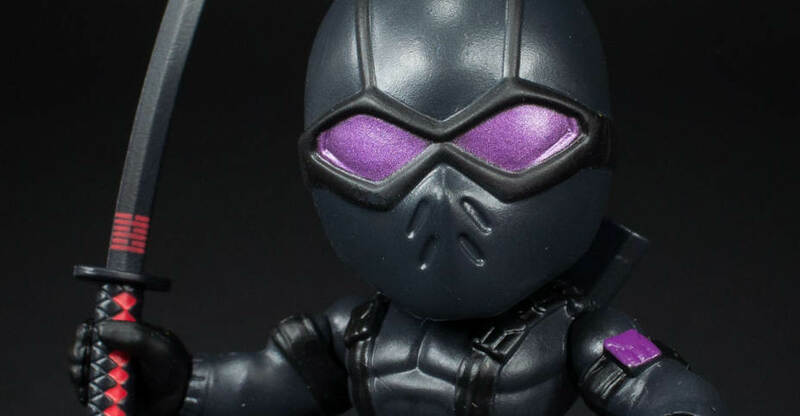 What are your thoughts on the G.I.Joe SDCC exclusive? Sound off after the break! Check out this amazing G.I.Joe 35th Anniversary Print by Scott West of Weststudio3! 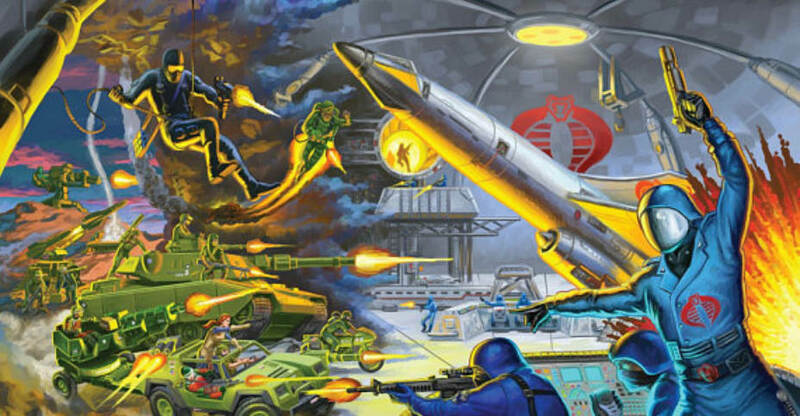 The artwork depicts all of the awesome G.I.Joe & Cobra characters that debuted in 1982, including the Missile Command Center! The 11X17 prints are signed and numbered to 82 for $20. There’s also a G.I. Joe 35th Anniversary Mickey Mouse Variant print! There’s only 35 of these available. Changes include Zap’s double-handled bazooka and of course Cobra Commander’s rare “Mickey Mouse” logo on his chest. The variant will cost you $30 and is signed and numbered to 35. Shipping is $10 which includes tracking and insurance. No extra charge for multiple prints shipped together. If you don’t have an Etsy account, you can Paypal Scott directly at scottweststudio@hotmail.com. Please specify which print, the quantity, and your address in the notes section to help Scott keep track of your order. Will you be adding one or both of these awesome prints to your collection? Have you already done so? Sound off after the break! G.I. Joe: A Real American Hero comes to life with these great mini-figures! This G.I. Joe A Real American Hero 3-Inch Random Figure Series 1 Mini-Figure is one in a line that features some wonderfully stylized vinyl mini-figures with the likenesses of your favorite characters from the G.I. Joe: A Real American Hero series. Each figure measures 3-inches tall and is blind-box packaged with head and arm articulation for fun posing. Plus, you can mix and match the awesome array of interchangeable weapons that the figures come with! This awesome collection even features rare chase figures for you to try and collect. Featured in this collection are Snake Eyes, Blowtorch, Cobra Soldier, Copperhead, Firefly, Dusty, Crimson Guard, Roadblock, Beach Head, Major Bludd and more! We have over 50 photos of the The Loyal Subjects G.I. Joe Action Vinyls Wave 2 Figures. Entertainment Earth sent along these figures, read on to check out the images! Thanks to HISSTANK.com boards member OreoBuilder for posting up his Custom G.I. Joe Modern Era Cobra Security Troopers! 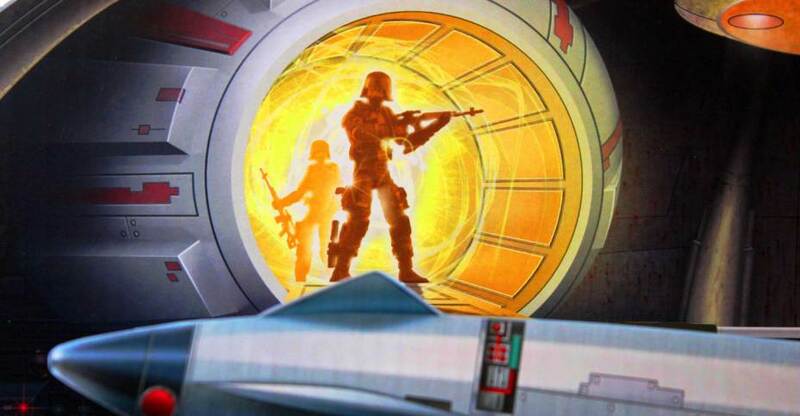 Check out all the Cobra Security Trooper images after the jump. Thanks to our friend Sam Sears and NerdRahtio for sharing this fantastic gallery of images from his visit to The Loyal Subjects Headquarters (lucky guy!). While he was there, he was able to get some hands time with the upcoming Baroness figure. Now, to get the full scoop on The Baroness, you’ll have to check out Sam’s review on The Loyal Subjects Official Facebook Page. You can check out the full gallery and join in on the discussion after the break! This may be old news for some, but for those of you out there that have been having difficulty finding a particular G.I.Joe 50th Anniversary item, then TRU.com may be your best bet. Most, if not all 50th Anniversary offerings are in stock online. We’ve collected the links below for your shopping pleasure. Orders over $19 ship free, so get your fill while you still can! 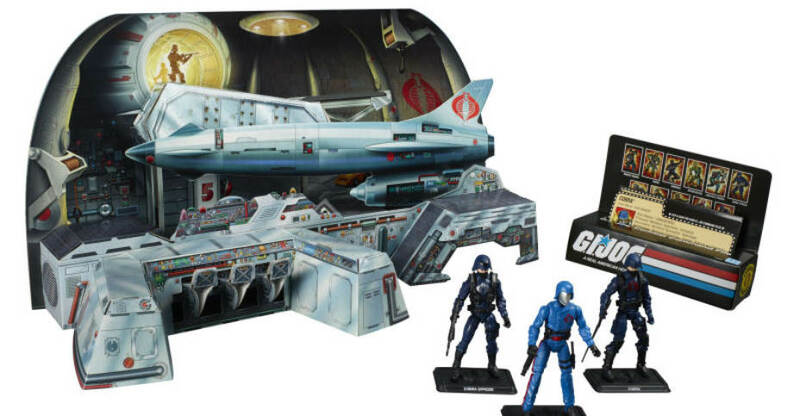 You can let us know what you added to your G.I.Joe 50th Anniversary collection after the break! 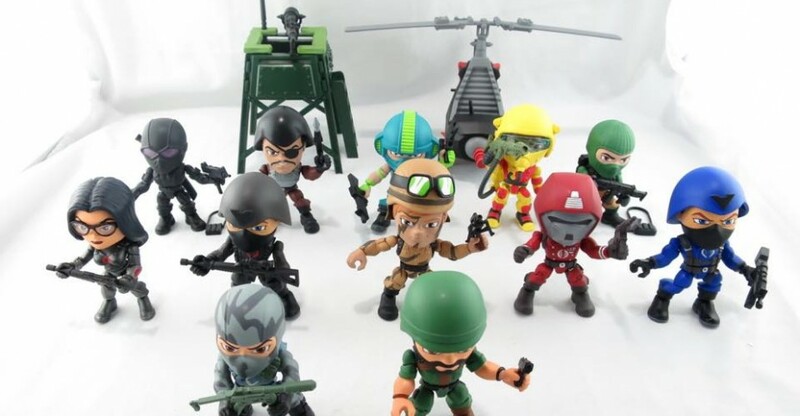 By way of the The Official Loyal Subjects Facebook Group Page comes an image that is sure to please those of us that collection Vinyl figures – A group shot of all the upcoming offerings to be featured in the 2nd wave of G.I.Joe Action Vinyls! This new wave features new articulation for our Action Vinyl Heroes and for the first time ever, now have vehicles and playsets to interact with! These are coming our way soon, so if you haven’t already, make sure to get your pre-order in at your favorite online retailer! 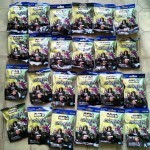 Kre-O G.I.Joe Wave 4 Kreons Found At Retail! The blind bag codes have been removed in the same fashion as Wave 5. The UPC on the outer bag is 65356998519. All times are GMT -4. The time now is 8:00 PM.